Estonian mobile music app startup 3Plet has just entered top 5 at the Meffy Awards in 3 categories: Social & Entertainment App, Content Service and Innovation Business Model. I was waiting for news from 3Plet for a while. I met the co-founder and CEO of this Estonian startup Vlad Davydov about a year ago in St Petersburg at the Mobile VAS and Apps Conference last year, and saw the music album app which looked quite crisp on his iPad. Davydov is a managing director of Icon Management, the marketing agency that promotes international musicians in Russia. 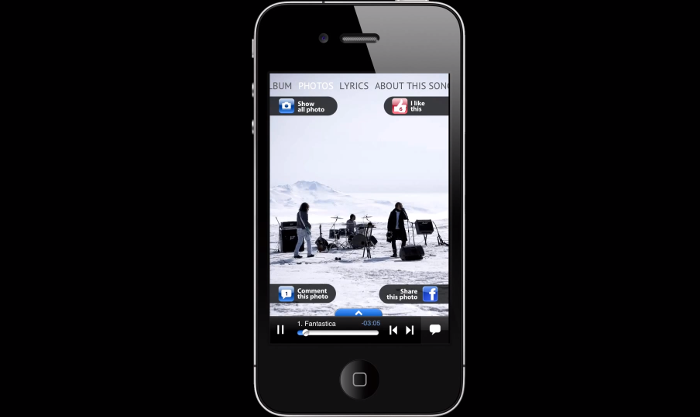 What he created fits well with the needs of musicians as far as mobile marketing strategy is concerned. 3Plet allows musicians create mobile apps out of their albums, which includes music, images and lyrics just as CDs used to do before we stopped buying them. It may be a niche product for music lovers, but certainly the dedicated fans are more likely to want to purchase the albums from the artist directly, than pay a subscription to Deezer or Spotify. 3Plet is not planning to market the albums for the musicians but to offer them apps as another marketing channel in addition to selling individual songs through iTunes. Creating an app cost 350 Euro, plus 1 Euro support cost per platform (iOS, Android, Windows and Symbian). Once the album is published, and Apple takes its cut, the resulting revenue is split 80 percent for the artists and 20 percent for 3Plet. The musician must transfer non-exclusive rights in using the content in the mobile app. Many avid music lovers prefer to buy albums to buying individual songs. Davydov says that the existing off-the-shelf app making tools do not help musicians to build apps around an album, and believes that a dedicated app focused on albums and featuring its artwork offers a greater added value to capture the attention of the listeners. Plus up to 10 images can be added to each song to further enrich the content of the app. Overall Davydov believes that 3Plet-based app result in better “user experience” if you like for dedicated fans. Three songs are offered within the app for free, and otherwise there is an option to purchase the whole album. Amongst the app features are integration with social media such as Facebook, Twitter and YouTube which content is fed into the mobile app. Facebook login offers further social integration and sharing for the users. The app also cross-promotes artist’s other albums. As far as the economics work, it is a higher price to pay, than say, through an aggregator which can push music into various streaming services (which can be as low as $11 per album per year). Yet for the musicians with an established fan base having a mobile app would be a nice extra product to offer. In AppStore there is one for Pearl Jam. The Meffys is the award for mobile content and commerce that has been running for 10 years. The winner will be announced on November 14th. It is also nice to see the Russian Cut the Rope amongst the nominees.